Is it possible that any of the events of April 15th were staged? Yes. Many people’s first reaction to scenes of the bombing were that of disbelief – it was gruesome like no one had ever seen before – not even from war photos. Truly horrific and shocking. So much pain and suffering for so many victims and their families. Still, there are skeptics, but not as much as to what happened (most people tend to take the bombing itself on face value), but rather, how perfectly it was was captured on film and in picture, from the stunning colorful plume cloud explosion which shot perfectly into the street – almost like a Hollywood film, or the ripped and torn cloths of victims, and the bright red colored spatters of blood on the pavement, or like the icon images of victims with legs and fingers blown off, being rushed away in wheel chairs where they would be photographed perfectly. This is the comment we hearing over and over, “It almost seems staged”. The evidence does back-up this assertion. From the photos, to the FBI suspects, to the homilies by law enforcement and Washington officials – and unlike post 9/11, many more people this time are heard to be saying, “It just doesn’t add up”. 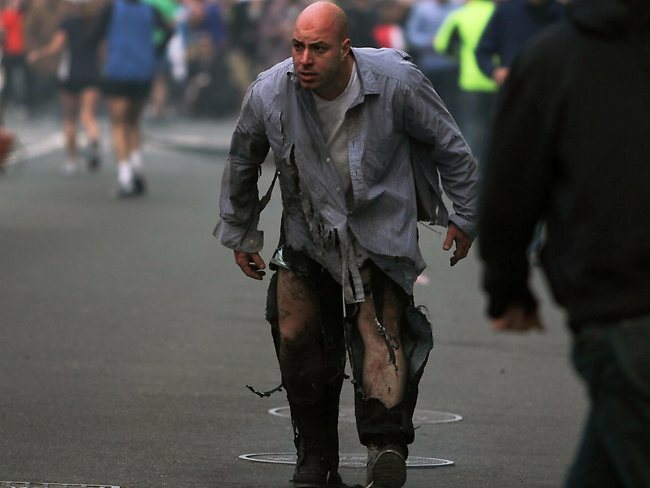 AWARD-WINNING PHOTO: Like a scene from TV’s ‘Incredidible Hulk’, a Boston Bombing crisis actor is seen with torn cloths, but no sign of any cuts or wounds. This works for movies, but unfortunately, it doesn’t fly in real life. Some are saying it was designed for full public and emotional effect, and some may also argue that the most celebrated and famous scenes and pictures seem to defy the laws of physiology. So we’ve asked some professionals who work in trauma surgery and emergency response. – Why are so many EMT’s, and police wearing sunglasses, on such an overcast Boston Marathon day? – Who is the man wearing a hood and sunglasses who was seen helping the double amputee, and why was he so keen to conceal his identity? – How could someone who had both their legs blown off still remain fully conscious and awake after so long? – Why are amputees and bombing victims all being carted off in wheel chairs? Doesn’t this break the first rule of basic first aid, let alone that of professional EMT or EMS workers on site? Why not use backboards or gurneys? – Why does the blood on the pavement look like bright red paint, and not like real color of blood? This blogger below who says he has worked as a professional EMT has questioned the narrative that all this just fell into place naturally on the day, and goes so far as to call it a fully staged event, complete with actors. NOTE: If you work as an EMT or have experience in a real medical theatre, your feedback and comments in our comments section are most welcome. If you loose both your legs from explosive trauma half your blood is gone in one minute via the femoral arteries, you’re dead after two. Bleeding out is worse with blunt force trauma (like shrapnel) because flesh is torn rather than cut, exposing more arterial and vascular tissue. The human body holds 5 to 6 LITERS of blood. If that really happened you would see blood EVERYWHERE, the guy would be drenched in it. Its not even tied off, its suspended via gravity, which would literally do nothing to an arterial sever. There’s no pressure applied. There’s no knot with a turn stick for leverage. You can clearly see a gap in the nonexistent wrap job on his left inner thigh (left anterior proximal for you experts) His hands have no blood on them. There’s no blood on the ground. The color in his hands and lips shows good circulation. Here in frame six on the left we see the the man with a hood setting up the fake leg wound prosthetics. His attention and hands are right there. The woman is acting as a shield covering what’s happening. In frame eleven after recieving the go signal the woman makes an open hand gesture the direction both of them are looking, signaling the staged injuries are in place for cameras. The prone amputee raises his left prosthetic injury into the air over the woman’s shoulder. No blood is present. The bone is dry, no blood on his leg above the knee, no blood on the woman, no arterial spurt, nothing. Frame twenty, the fake blood and prosthetics are in place. The amputee gives an open hand gesture along with the woman to bring the cameras in. We’re now twenty frames in and still not a drop of fresh blood from a double leg amputation. His legs are dry, the woman is dry and unscathed. Both are making the same hand gesture. Something about this entire thing smells to high heaven. When have you ever heard of someone with a blown off leg not bleeding? Some make the claim that it was cauterized, but obviously, the picture of them wheeling the guy out on the wheelchair shows ‘blood and gore’ (a cauterization is a burn that seals the wound). Something changed between these images and when they wheeled him out in front of the cameras. This image was taken by a third party photographer seconds after the first explosion. There is clear evidence of false flag staging here. The man in the red coat and baseball hat on the right is kneeling down giving directions to the guy in the white T-shirt. Also looking to this pair for direction are the woman sitting to the right and the man in a hood and sunglasses who set up the double amputee prosthetics. Notice the relaxed posture and face of the hooded man. Notice also the calm prepared posture of the woman sitting down on the bottom right. See how her shirt sleeve is severely torn, yet her skin underneath is clean and clear of injury and blood. From where she’s sitting look right to the bottom right corner and you can see an unmarked bottle of fake blood. Look to the left and see the cowboy hat man standing there doing nothing. This is the same man who will pretend to hold the tourniquet of the fake amputee actor later on. Look to center of the photo and you will see the african woman moving herself away from the amputee actor since her shielding him from camera’s job is over. Next to her is a woman with red hair leaning on her elbow. Compare this now with another photo taken seconds later. Putting them side by side is very helpful. The man with the hood and sunglasses, who was just sitting up looking fine and healthy after fixing up the amputee actor’s prosthetics, is now on his back being evaluated by two people. Notice the rips in his jeans have no sign of blood or injury on the skin. The woman with red hair however is in the exact same pose as a minute ago. Meanwhile the double amputee actor is completely ignored by everyone when he is clearly in the most dire need of attention. There is a small amount of fake blood around him where the african lady shielding him used to be, she has dissappeared. What happened to her? Compare this photo with the first in my post. In a real medical scenario the amuptee would receive immediate treatment or die from bleed out. The fact this actor woman is removed from the scene via stretcher while the double amputee is left on the ground is ludacris. He would be dead from blood lose before they could even begin spinal assessment procedures involved in moving a patient to a stretched. Not to mention his blood lose would be over five liters, enough to cover the entire scene around these people in a thick puddle. I know that many just want to believe. But I can’t help but think. So much doesn’t add up. KPatrickRyan shared an updated picture of the Bauman guy in the hospital (visited by Bradley Cooper). Compare him to the wheelchair man (Vogt???) and tell me who’s who. If for some reason you actually liked this post, click the “Like” button below. If you feel like someone else needs to see this (or you just want to ruin someone’s day), click the Share Button at the bottom of the post and heap this upon some undeserving soul. And as sad as this thought may be, it may be remotely possible that us rednecks here at The Revolt please you enough (or more than likely, you are just a glutton for punishment?? ), that you feel an overwhelming desire to subscribe via the Email subscription and/or RSS Feed buttons found on the upper right hand corner of this page (may the Lord have mercy on your soul).